Father, you continually raise up your faithful to the glory of holiness. In your love kindle in us the fire of the Holy Spirit who so filled the heart of Philip Neri. We ask this through our Lord Jesus Christ, your Son who lives and reigns with you and the Holy Spirit, one God, for ever and ever. Amen. 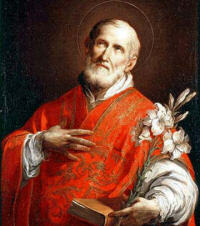 St. Philip Neri (1515-1595) was born in Florence and died in Rome. He lived a spotless childhood in Florence. Later he came to Rome and after living for fifteen years as a pilgrim and hermit was ordained a priest. He gradually gathered around him a group of priests and established the Congregation of the Oratory. He was a man of original character and of a happy, genial and winning disposition. A great educator of youth, he spent whole nights in prayer, had a great devotion to the Blessed Sacrament, and burned with an unbounded love for mankind. He died on the feast of Corpus Christi. According to the 1962 Missal of St. John XXIII the Extraordinary Form of the Roman Rite, today is the feast of St. Eleutherius, who governed the Church for 15 years, after the persecution of the Emperor Commodus. He died in 192. This feast may be celebrated in particular churches. This gracious, cheerful saint was Rome's apostle of the sixteenth century (1515-1595). A peculiar charism was his burning love of God, a love that imperceptibly communicated itself to all about him. So ardently did this fire of divine love affect him during the octave of Pentecost in his twenty-ninth year that the beating of his heart broke two ribs. It was a wound that never healed. For fifty years the saint lived on in the intensity of that love which was more at home in heaven than on earth. Through those fifty years his was an apostolate to renew the religious and ecclesiastical spirit of the Eternal City, a task he brought to a happy conclusion. It is to his credit that the practice of frequent Holy Communion, long neglected in Rome and throughout the Catholic world, was again revived. He became one of Rome's patron saints, even one of the most popular. Philip Neri loved the young, and they responded by crowding about him. As a confessor he was in great demand; among his penitents was St. Ignatius. To perpetuate his life's work, St. Philip founded the Congregation of the Oratory, a society of secular clergy without religious vows. The purpose of his foundation was to enkindle piety among the faithful by means of social gatherings which afforded not only entertainment but religious instruction as well. Joy and gaiety were so much a part of his normal disposition that Goethe, who esteemed him highly, called him the "humorous saint." It was his happy, blithe spirit that opened for him the hearts of children. "Philip Neri, learned and wise, by sharing the pranks of children himself became a child again" (epitaph). As a youth Philip Neri often visited the seven principal churches of Rome. He spent entire nights at the catacombs, near the tombs of the martyrs, meditating on heavenly things. The liturgy was the wellspring of his apostolic spirit; it should likewise motivate us to Catholic Action. Patron: Rome; United States Army Special Forces. Symbols: Rosary; lily; angel holding a book. St. Philip Neri was well known for his sense of humor. To honor him today try to laugh at yourself when something annoying happens, try to make someone else happy by your cheerful disposition. St. Philip's favorite feast was Corpus Christi. Make a visit to Jesus in the Blessed Sacrament. Eleutherius was born at Nicopolis in Greece. He was a deacon of Pope Anicetus, and was chosen to govern the Church during the reign of the emperor Commodus. At the beginning of his pontificate he received letters from Lucius, king of the Britons, begging him to receive himself and his subjects among the Christians. Wherefore Eleutherius sent into Britain Fugatius and Damian, two learned and holy men; through whose ministry the king and his people might receive the faith. It was also during his pontificate that Irenaeus, a disciple of Polycarp, went to Rome, and was kindly received by Eleutherius. The Church of God was then enjoying great peace and calm, and the faith made progress throughout the whole world, but nowhere more than at Rome. Eleutherius governed the Church fifteen years and twenty-three days. He thrice held ordinations in December, at which he made twelve priests, eight deacons, and fifteen bishops for diverse places. He was buried in the Vatican, near the body of St Peter. Symbols: Model of Tournay cathedral; flaming oven; dragon; scourge; angel bearing scroll.